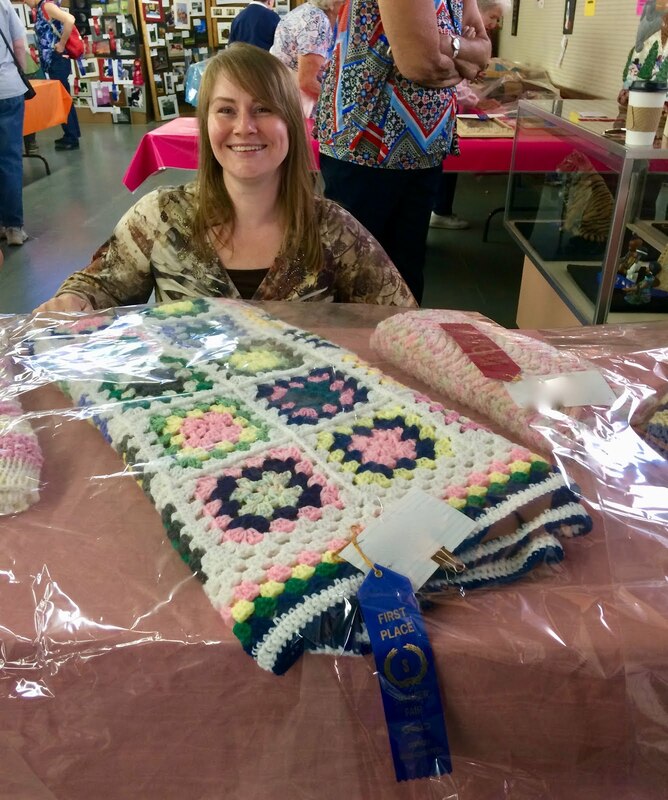 Home-Cooked & Handmade: Results From The Fair!! Were We Winners? 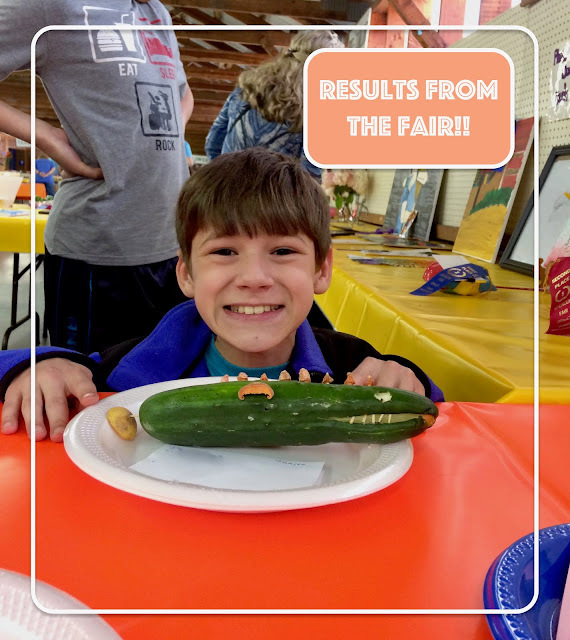 Results From The Fair!! Were We Winners? Are you ready for the results?!? 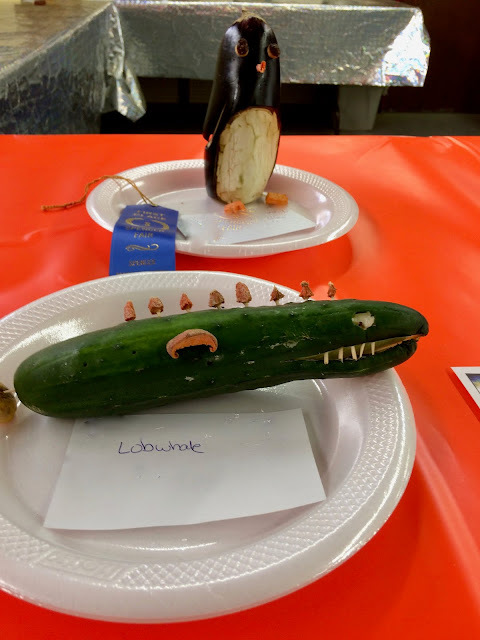 My kids, as I mentioned in the other post, thought it would be fun to enter Veggie Varmints in the creativity class at the fair. We saw some friends who entered last year and decided to give it a go. A week ago, my daughter, son and I scoured Pinterest for ideas. Pinterest has everything, you know! My son didn't want to be boxed in by anyone else's design and decided to go freestyle. We purchased a variety of vegetables and he just went for it. In the end he created the Lobwhale. It was a very cute sea creature-looking creation. He had a lot of fun making it and was happy with his result. Unfortunately I forgot to take pictures when it was fresh, so you only get to see a wilted version after three days of being unrefrigerated. So use your imagination and rehydrate those carrots! 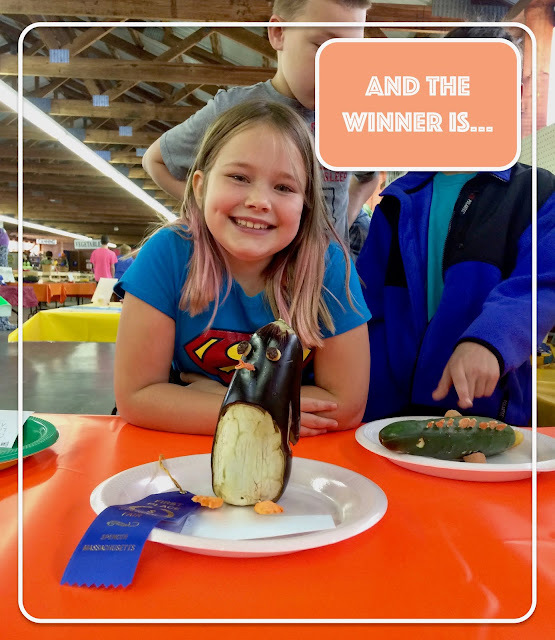 My son didn't quite make the prize circle, but he had a great attitude and was very pleased that he had entered. I even think he wants to do it again, so that's a win in my book! My daughter found inspiration on Pinterest and had it in her mind for days that she was going to do this one specific thing. She was almost swayed by her brother's free-styling idea, but in the end went with her original plan. And it paid off! She got the blue ribbon! She won first prize for the eggplant penguin she named Happy Feet. My daughter was so excited and very proud of herself. I was happy for her as well, especially because there was a moment in there where I thought she might just throw in the towel. But she persevered and in the end came out with a win! I got a blue ribbon, too! Ok, there were only one or two other afghans in the class, but I won!! I know it's quite the small victory, but I can't lie, it was gratifying to see that blue ribbon pinned to my project. It makes me want to do it all again next year. I'm already coming up with new ideas! So have you ever entered your project in a contest? This was a first for me and it was so much fun. It was motivating to have a goal to work towards. Just like I talked about in my series, 30 Days 30 Recipes, having goal and accomplishing it is so incredibly rewarding. And the win is just icing. I've discovered some things about myself this year. I need goals! They don't have to be lofty goals or even anything I share with other people. I just need something to strive towards. Contrived or not, goals create purpose and make me happy. And I think that might be the secret for everything.